Jessica Hammond, senior associate athletic director, shared these words as she welcomed the UMBC community to a special gathering in remembrance of the 49 victims killed in the tragic June 12 shooting at the Pulse nightclub in Orlando. 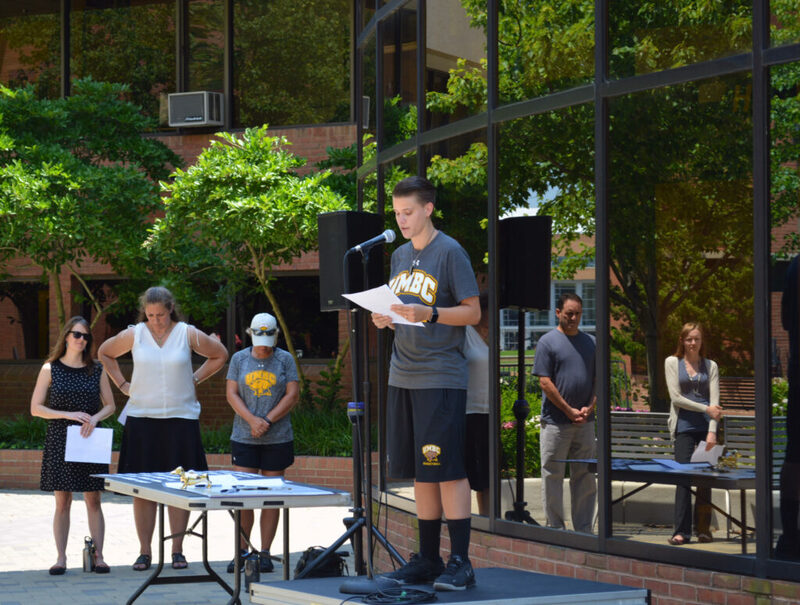 UMBC Athletics, Student Life, and LGBTQ Faculty and Staff Association (LGBTQ FSA) hosted the memorial on June 27 in UMBC’s Administration Plaza, inviting members of the campus community to speak as well as attend. President Freeman Hrabowski began the program with a reflection on the multiple meanings of silence. 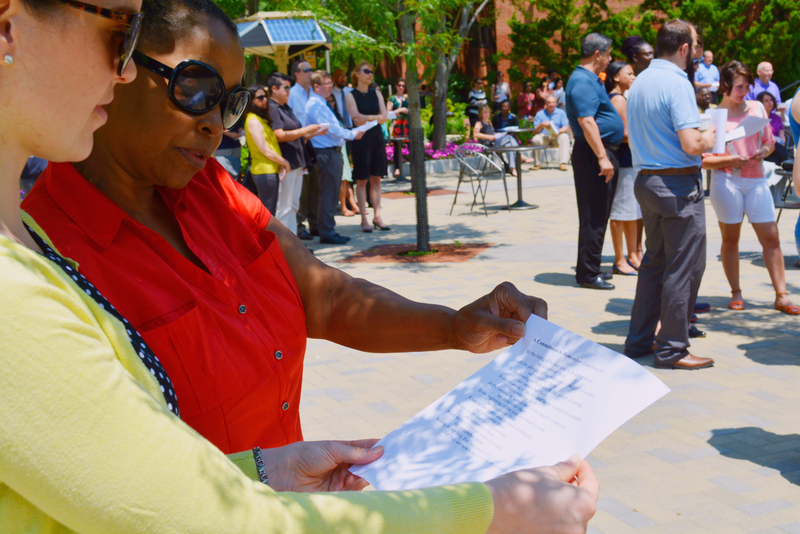 Speaker Esther Karimu ’18, health administration and public policy (HAPP) presented an original poem of remembrance, followed by student athlete Pandora Wilson ’17, HAPP, who read the name of each victim and led all gathered in a moment of silence. …as we all mourn the loss of those who perished in the Pulse nightclub in Orlando, we must remind ourselves that hate is not the answer to hate. […] America was built on the foundation of having many differences. It is important to remember that these differences are what make us unique and these differences are what make us the United States. […] I would like to ask and encourage all of you for your support to be united…in the LGBTQ community’s fight for respect, love, and dignity. Anne Brodsky, professor of psychology, associate dean of the College of Arts, Humanities & Social Sciences, and member of the LGBTQ FSA, also reflected on the Orlando tragedy, in the context of ongoing acts of violence in the U.S. and around the world. These acts, she noted, disproportionately impact people of color, economically disadvantaged communities, and LGBTQ+ people. That this tragedy occurred in June, the month that the gay community celebrates the historic fight of the gay rights movement in the U.S., and all the advances that we’ve made in this country and around the world, is particularly heartbreaking. Unfortunately, despite our many advances, fear, hatred, social and political backlash, and violence are not just a part of our history, but continue to be a part of the everyday experience of many in our community. The recent attack in Orlando was horrific and has filled us all with an unspeakable sadness. So many LGBTQ people, myself included, go to clubs like Pulse to feel safe, to feel accepted, so processing what happened has been really difficult. Innocent lives were lost in a senseless and hateful way. We have fought together to secure dignity for the LGBTQ community and this hateful act reminds us that the fight continues, and we need to stick together through every obstacle. Photos by Dinah Winnick for UMBC.